When you install several App-V 5 Server components onto a single machine, each component requires a separate IP Port during installation. If IIS’ Default Web Site is bound to port 80, you cannot use that, even when you only want to install a single component on that machine. So, clients communicating to a ‘co-hosted’ App-V 5 Server initially need to establish a connection to a non-default (‘higher’) port. If more than one component (Publishing, Management, Reporting or Streaming) is used, more of those ‘higher’ ports are required. This is fine in an internal network, but as soon as there are firewalls or proxies involved (network security zones, VPN), you may want to limit the amount of open ports, and you may want to use a ‘default’ http port only. So what can be done to bind all App-V components to a single port, let’s say 80? Lucky wise IIS supports the concept of Host Headers that allow to distinguish between web applications based on the URL they are queried at. Unluckily, the App-V setup wizard does not support that, so we need some tweaking here. This guide is not directly applicable for secured (https) connections. Using Host Headers with SSL certificates requires additional configuration. At the beginning, you prepare your IIS machine as described in the App-V Server’s system requirements. This includes installing the IIS role with some features. Note that you should leave the Default Web Site’s port to 80 and don’t change it. 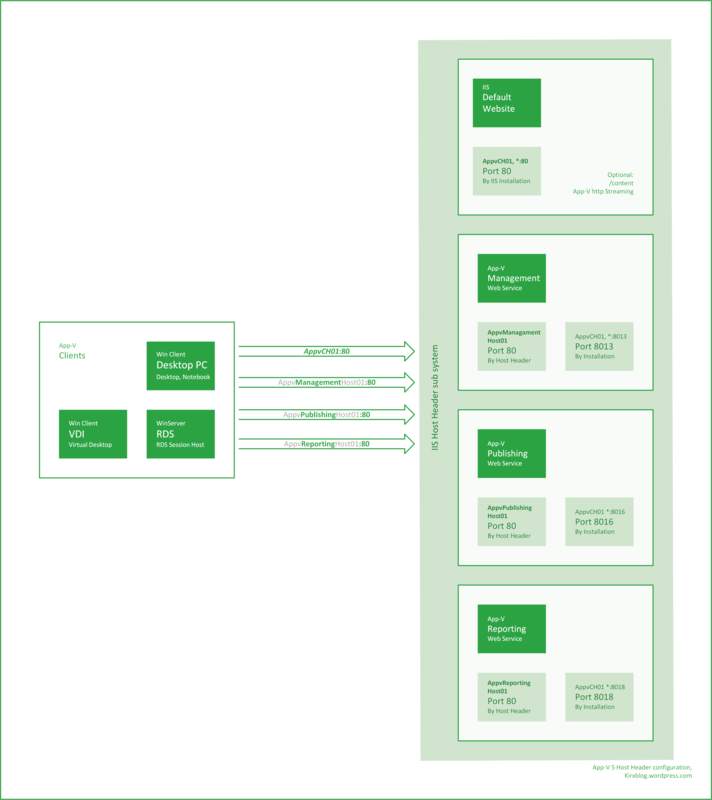 Then, you install the required App-V Server components at once or one after-the-other. It doesn’t matter if you use the graphical wizard or the command line – just install them, assigning different ports to each component. In the example below, I used 8013 for the Management server, 8016 for Publishing and 8018 for Reporting. As indicated, ‘host headers’ will be used to identify individual services. Essentially this means that every service has to get an individual DNS name. 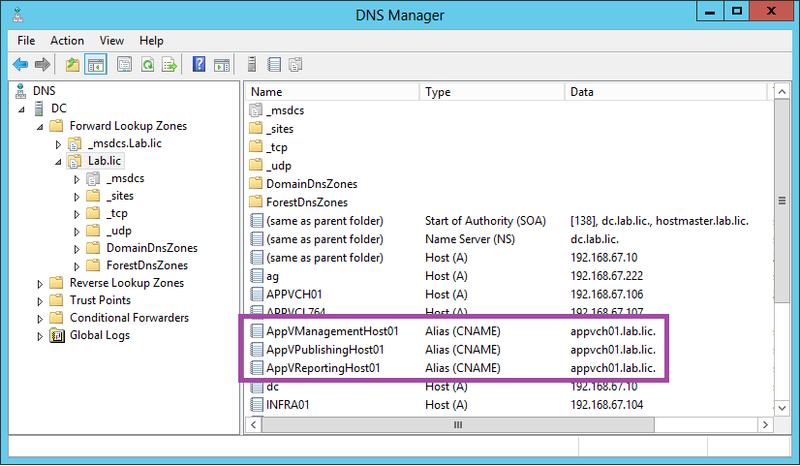 You may create three new aliases on your DNS server, like AppvManagement, AppvPublishing and AppVReporting, each pointing to the same IP address of your IIS machine. In my example I added ‘Host01’ just for the sake of demonstration. For the Streaming Server feature, you don’t need to add a dedicated host header/port. If you decide for http streaming from the co-hosted server, this usually is achieved by adding a new Virtual Directory to the Default Web Site. Since the Default Web Site already listens to port 80, no additional preparations have to be made. Later on to all incoming connections on port 80 that are not covered by a host header still will be processed by the Default Web Site. For a test, try to ping all hosts. Or, if not disabled on IIS, even try to connect to them using a browser. At this time queries should point to the default web site. In IIS Manager, configure the “bindings” for each of the App-V services. You may do this using the GUI or command lines. Note that IIS7 (Win2008R2) and IIS8 (Win2012) can use different commands. Using IIS Manager, navigate to the individual site. A right-click on the site name or the action pane shows you the “Binding” action. Here you can add/modify them. For IIS7, the command appcmd can be used. Appcmd supports two different ways of how to specify parameters. I opted for the ‘user friendly’ one. Note that appcmd set overwrites (and not adds) the new binding to a service. Therefore, you have to specify the original binding to the original ports as well. appcmd set site "Microsoft App-V Management Service" /bindings:"http://*:8013,http://AppvManagementHost01.demo.lab:80,http://AppvManagementHost01:80"
appcmd set site "Microsoft App-V Publishing Service" /bindings:"http://*:8016,http://AppvPublishingHost01.demo.lab:80,http://AppvPublishingHost01:80"
appcmd set site "Microsoft App-V Reporting Service" /bindings:"http://*:8019,http://AppvReportingHost01.demo.lab:80,http://AppvReportingHost01:80"
Note that the add-webconfiguration does not replace, but add parameters. Therefor the original ports (8013, 8016, 8019) don’t show up here – and we use two commands for each service, one for the short name, one for the FQDN. You should not modify the App-V Server component’s individual configurations (in the Registry). They still point to the original server name and ‘high’ IP Port. Host Headers allow you to offer several App-V Server components from an individual machine sharing the same port, like 80. This is namely useful for sharing default http port 80 between the Publishing Server component, the Reporting Server component and potentially the Streaming service offered by native IIS. Often you don’t need to configure port sharing for the Management Server, because it isn’t addressed by clients and thus may not require special firewall configurations, but of course you can do it easily as well. Also note that you may want to use a different machine for streaming the .appv files from (file or web server), mainly to separate configuration traffic from data traffic (though we described its co-hosting here as well). Remember that configuring a secured connection (using HTTPS) requires more planning (while it is easier for IIS8 than for IIS7), including the requirement for wildcard certificates (*.company.dom).